How to Prepare for IBPS RRB Officer Scale-I Interview 2017. Welcome to the www.letsstudytogether.co online interview preparation section. First of all, big congratulations to all of the candidates here who have crossed the most crucial two hurdles of becoming an Officer Scale-I in a Regional Rural Banks. 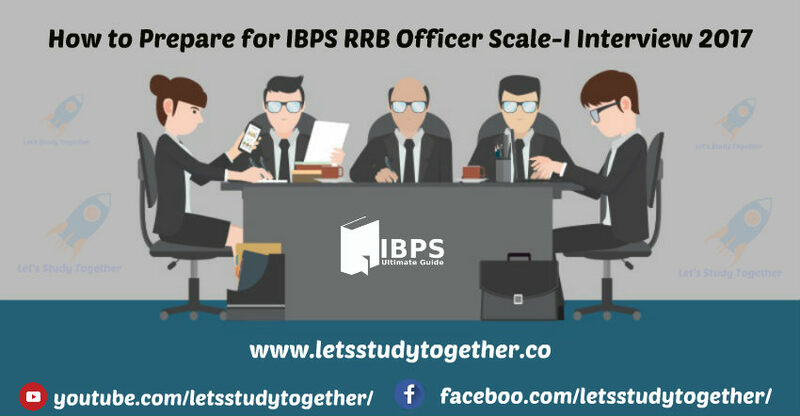 An interview is the last and a very important process in IBPS RRB Officer Scale-I Recruitment as only 1 out of every 3 candidates is selected in the process. And as IBPS RRB Officer Scale-I Interview is going to be held very soon, it is very important that every candidate starts preparing for this phase in a very professional way. Yes, professional, because you must not take it casually. IBPS RRB Officer Scale-I Interview 2017 is the test of the personality of a candidate as in a bank; it is of utmost importance, sometimes, more than your knowledge. In Interview, your attitude, confidence, fluency and, knowledge everything matters a lot. Yes, it is not just about the knowledge, more than that it is about your ability to deliver your knowledge and thoughts. Nervousness gets in human nature in some difficult and strange situations and that might happen during your interview too, but it is important that how you face it without showing the obvious signs of panic. There will be many situations when you will not know the solution to a problem but you can manage the situation with the help of simple smile and polite behavior. This is what is intended to be judged by an interview. So, what are the main qualities they look for in a candidate? Ability to handle Pressure and also give your best under Pressure. Arrange all required documents in order: The most important thing before going for the interview is required documents, since without proper required documents; you are not even allowed to attend the interview. Make a checklist of things to be carried along with you well in advance and get all the things in place well before the interview date. Printout of the IBPS RRB Officer Scale-I Interview Call Letter. Proof of Date of Birth (Birth Certificate issued by the Competent Municipal Authorities or SSLC/ Std. X Certificate with DOB) *** Original Copy. Mark sheets and Certificates for Graduation or equivalent qualification etc. (Which is mention at the time of filling IBPS RRB Officer Scale-I form.) *** Original Copy. Experience Certificates. ( If applicable) *** Original Copy. Caste Certificate issued by the competent authority in the prescribed format. (Issued by central govt.) *** Original Copy. Disability certificate in prescribed format issued by the District Medical Board in case of Persons with Disability category. *** Original Copy. Revise the Basics of your graduation / post-graduation Subject: This is also important since the interviewers judge your sincerity from the answers you give for the questions from your graduation / post-graduation subject. If you don’t know the answer please say “Sorry sir, I can’t recall this time.” But do not misguide them by giving wrong answers. Do not repeat a point, or be lengthy or irrelevant. Also intervene, if someone else is going on an irrelevant track. The questions can be asked from your academic background which aims to test your knowledge on the subject which you have studied during your Graduation. Read Daily Newspaper: Reading newspaper should be made a habit rather than a necessity. It is the panacea of current affairs, hence, this one month, read a standard newspaper as well as a financial newspaper in order to be aware of the happenings around you. *** Make sure you read Sensex data and current different RBI rates and dollar against rupees etc. Learn to say “No” in a very polite manner: At many times it is not possible for candidates being to know the answer of each and everything. However, how you express your inability to answer matters the most. A polite “no” will fetch you extra marks whereas a wrong intonation will attract penalty. So never give lame answers with confidence, it will make a bad impression and will prove that you are lying with confidence. Dress Well ( Formal Dress): As we all know that an interview is not a fashion show and hence, try to be dressed according to a formal office. Males can go with light striped shirt with trousers along with a tie (a tie is recommended but not mandatory). You shoes should be well polished whereas the belt should match the color of the shoes. Ladies should go with a saree or salwar. If in case, somebody wants to go in western, trousers along with light colored shirts are okay. Depending on whether you are being interviewed by one person or a panel of interviewers, greet politely ‘Good Morning’/Afternoon or Evening depending on the time of the day. If there is more than one person then address them as ‘Sirs/Madams’ and try to encompass them all in your greeting. Most probably you will be offered a seat. Do not sit down unless you are asked to. As you sit across the interviewer(s), look confident and relaxed. Make sure that you maintain Eye contact with the interviewers while answering questions. This is a sign of your confidence level. Speak clearly. Do not speak too fast while answering questions. Take a moment to think before you reply. Keep your arms either on your sides or in your lap. Do not fold your arms, as it is a sign of rudeness. Sit straight and do not cross your hands or legs. Always thank the interviewers as you leave. Don’t outweigh yourself with banking and financial terms: Just have the basic idea about the banking sector and do not try to go into the in-depth knowledge of anything. Sleep well in last Night: No burning of midnight oil the previous night, rather go to bed early and leave the interview alone for the night. Sleep properly and adequately. Reach before time: On the day of the interview, leave one hour earlier than the time required to reach the center. Thus, you’ll be able to reach before time and take some time to freshen up and calm yourself. The total marks allotted for Interview are 100. The minimum qualifying marks/scores in interview will not be less than 40% (35% for SC / ST/OBC/PWD candidates). The relative weightage (ratio) of CWE and interview will be 80:20 respectively for the Officers cadre. We will publish the Interview Mega Booster of IBPS RRB Officer Scale-I Interview 2017 soon and will start the Interview preparation exercises for this exam from the next week.